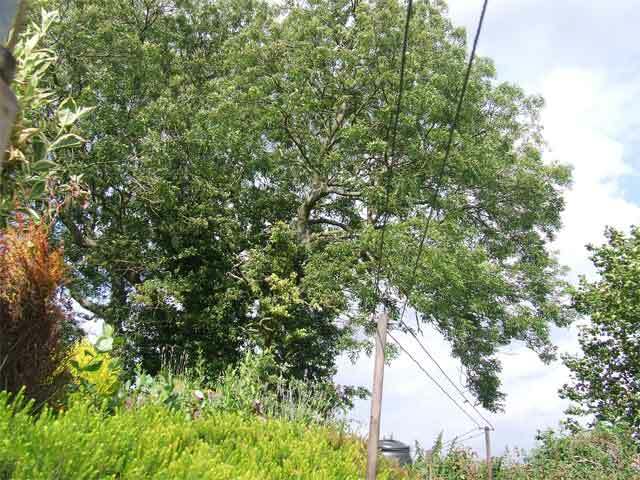 The making of the electricity/telegraph poles came about for a particular reason. The railway was getting increasingly trashed by two lovely dogs, not their fault because the railway was there before they were. But, they would dash about the garden together thoroughly enjoying themselves jumping over buildings and lights and their favourite, for some reason, walking the track! Not only them, also foxes used it as a toilet and again walking the track, cats ditto, and sometimes when it was covered with snow, humans stepped on things unknowingly. 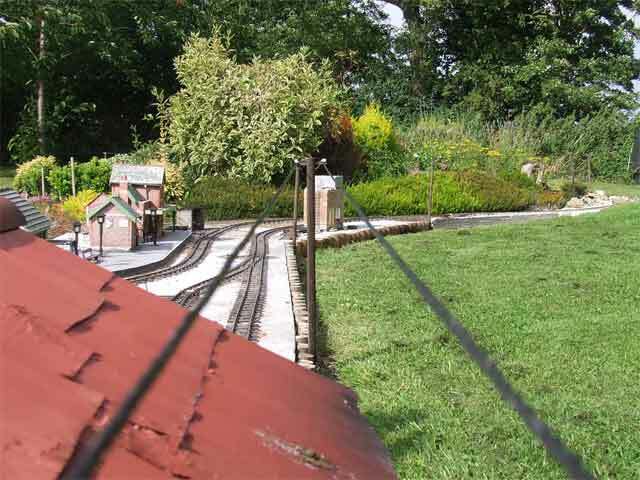 So, the idea of surrounding the whole railway with an electric fence came about. 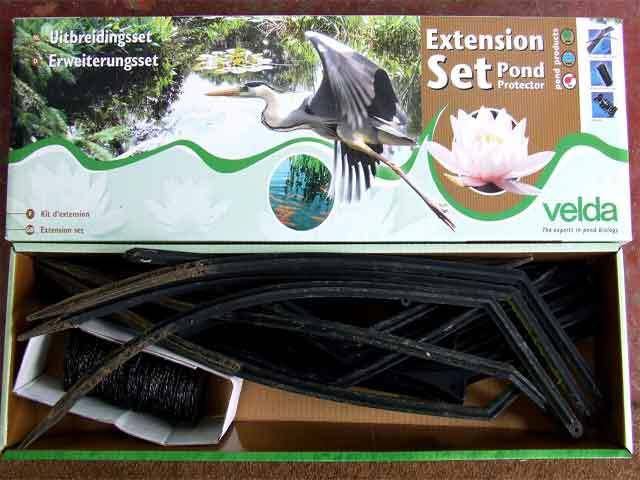 Now, we already had an electric fence which was round the big pond to protect the koi carp from herons and cats etc, so all we had to do was extend it round the railway instead (said carp are now big enough to look after themselves). 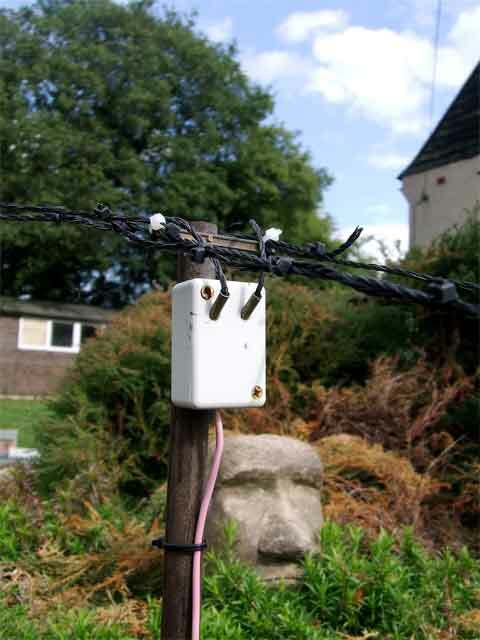 This electric fence was a proper commercial product that you can get at most good ‘water garden centres’. 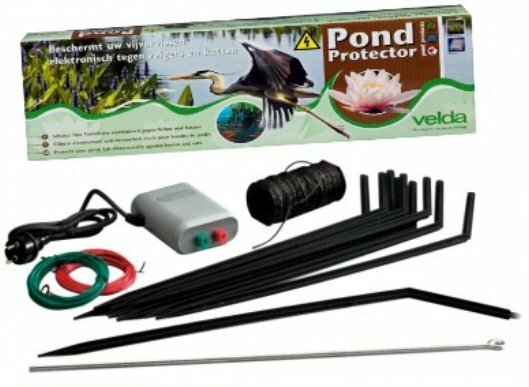 It was a ‘Velda Electric Pond Protector’ but I believe there are several types on the market now. 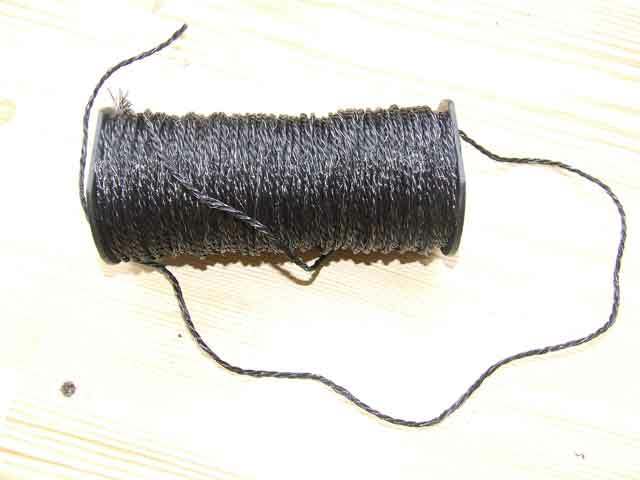 This was only just enough to go round the pond with two strands of wire so we did have to invest in an extension kit. 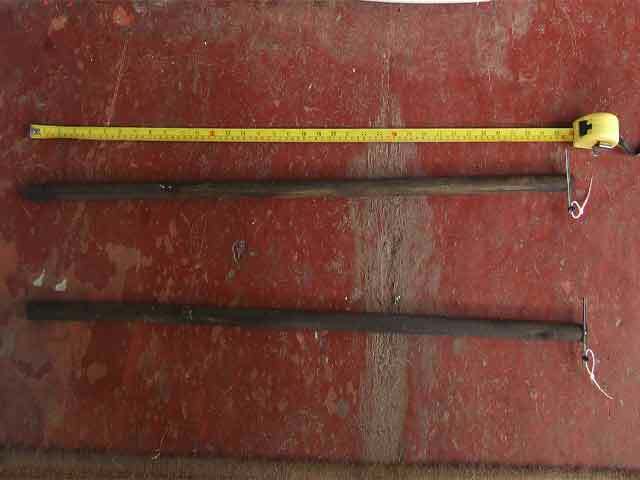 You can see from the photo the original stakes that we had to pull out from round the pond, we decided not to use them as they are not very ‘realistic’ and too short, they had always been a problem pulling out anyway. So the next thing was to get some dowling from a certain diy shop. This and the extension set were probably the most expensive things of the whole project. As you can see we left them quite long about 3′ I think and soaked them for a few days in a creosote substitute to prevent them rotting too quickly. These ones above have got the tops ready to receive the wires. These are only short lengths of old track which has been nailed in the centre to the pole. The cable ties are an essential part of this project by the way! 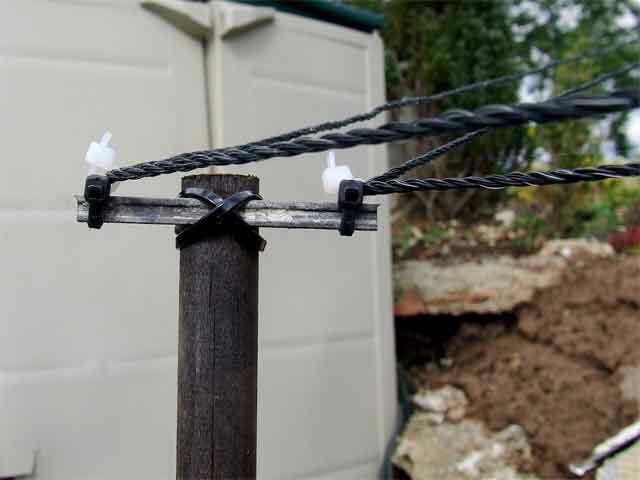 The idea of the black cable ties was to enable the white cable ties to be in line with the wire and not to act as an insulator from the metal rods. The wires running through are live and in parallel, so the whole top of the pole is live as it does not matter if something makes the wires touch anyway. But, it does make them look good, the whole thing is to give the look of proper insulators. We left the poles quite long to enable pushing enough into the ground to make them as solid as possible. So, onto the wire itself, hopefully from the photo below you can see that the wire is made up of lots of strand with fine bare wires running through it, ie the working part! It is quite stiff though so needs to be kept under tension to look good and work properly. Having decided the type and size of animals we wanted to protect the railway from we had to guestimate a height that would a) be at an appropriate height b) look good c) work! 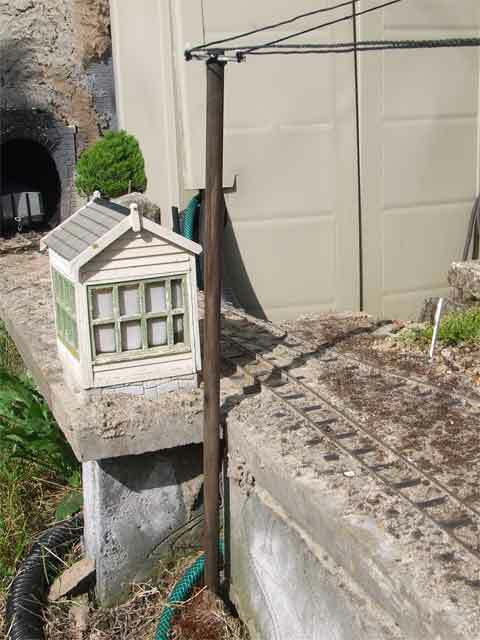 The garden electric box was very nicely positioned for the wires to emerge at a good starting point for the circuit of the railway. You can see the earth wire which is attached to a metal spike (supplied) and has to be near the live wires. The actual ‘junction box’ on the top is a plastic ‘projects’ box from Maplins. It was drilled at the bottom to let the live wire (pink cable) in and then connected to the wire supplied on the drum (wrapped round a bolt then nuts to keep in place). 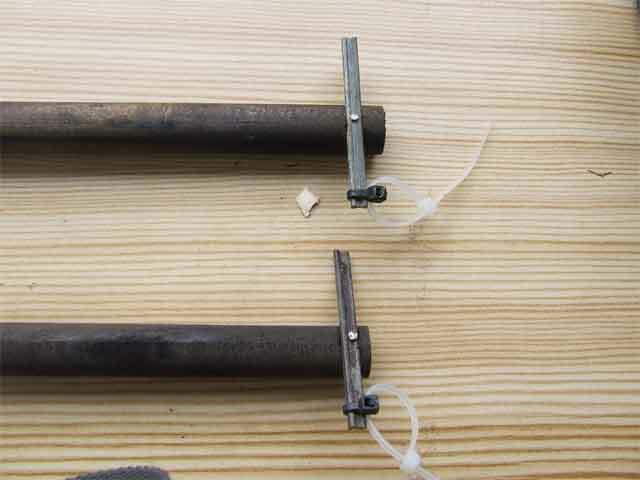 Two more holes were drilled parallel to each other for the electricity wires to come out and threaded through the white ‘insulator’ cable ties. The only problem with this is that you don’t want to have to cut or join the wires, so keeping it as one piece is the tricky bit! Best to place you poles where you want them first, all ready to take the wires. 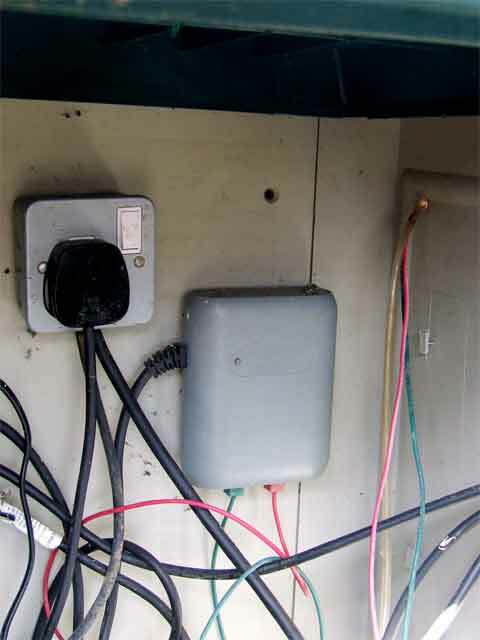 Here’s a closer look at the junction box. Basically that is it, once you’ve gone all round, just remember that the wires won’t curve round corners so you will have to carefully place the poles to get some good lines! Some will have to be reinforced with more cable ties to stop the top bar from twisting. Don’t forget they should all be more or less the same height to look realistic so you can use the extra length to adjust the height. 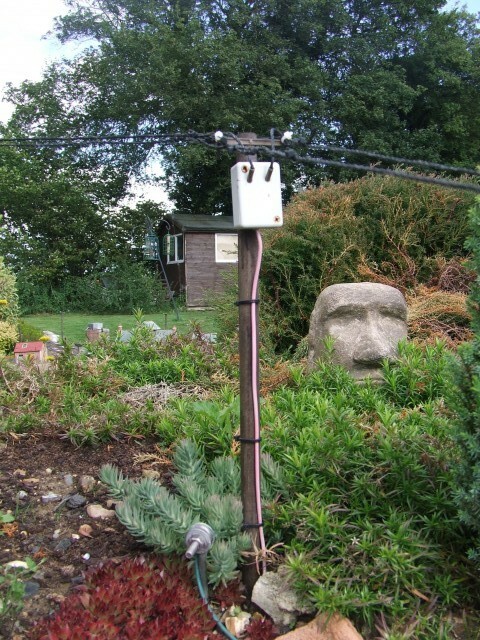 Just some photos of quirky angles to show the overall effect of the poles…..
Not bad eh? Pretty realistic we think, plus it works! Just remember, although it won’t kill anything it does give a bit of a packet so make sure you have an on/off switch that is easy to get to for when you want to run trains or even that open day you may have!